If you have to pull together a holiday dessert at the last minute, I highly recommend going with pecan pie. It's the easiest pie to make--just stir together a few ingredients, pour into a crust, and bake! The whole thing seriously takes minutes to prepare, and the final product? SO satisfyingly gooey and delicious. 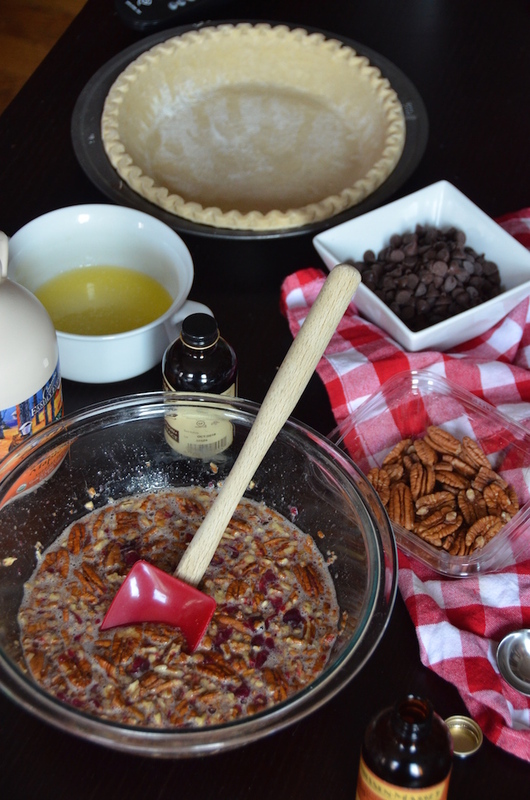 A quick caveat: I pretty much always use a pre-made pie crust for my pecan pies. It's not that I don't know how to make pie crust (I do). It's just that I HATE doing it. I know some people love it, but not me. I'm more of a stir and bake kind of girl (hence why I love cake). Anything with rolling and multiple steps and flour all over the place? So not for me. Now onto the filling! 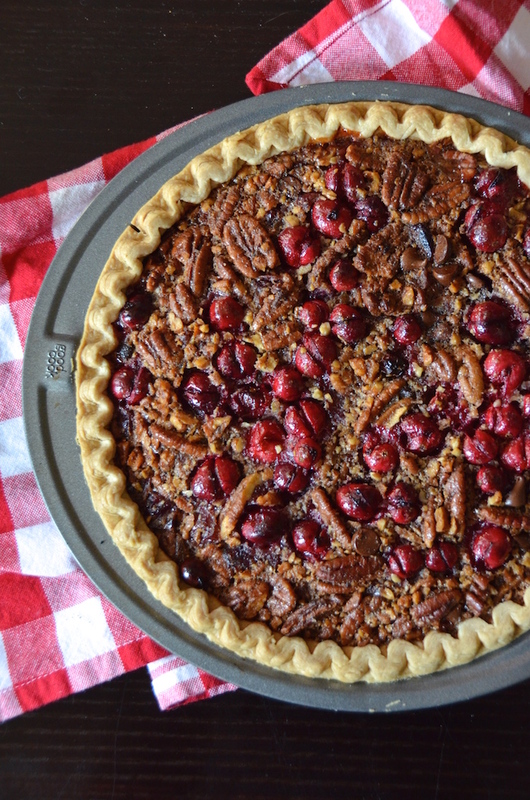 The tart fresh cranberries and maple syrup in this pecan pie help to balance out what is often a too-sweet kinda treat. I also added dark chocolate chips (because...hello...delicious! ), but you can skip them if you'd like. The entire filling is made in a single bowl, then poured into the crust and baked. Honestly, the hardest part about this whole thing is waiting for the pie to cool before you dig in! 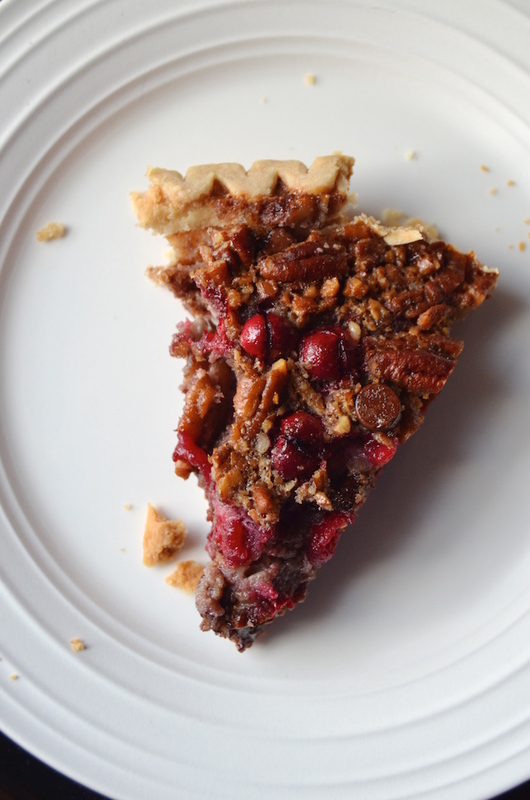 What's your favorite holiday pie to enjoy? Preheat oven to 350 degrees. In a large bowl, stir together the maple syrup, eggs, brown sugar, butter, salt, and vanilla. Stir in the pecans, cranberries and chocolate chips (if using). Pour filling into crust and bake 1 hour, or until filling is set around the edges and slightly puffed. Let cool completely at room temperature before serving.